On Thursday, radio station WKQX closed the first of five nights of its “The Nights We Stole Christmas” series at the Aragon Ballroom with a sold-out headlining set by Denver’s Nathaniel Rateliff and the Night Sweats. The sweat-soaked performance began with the deep groove of Joseph Pope III’s bass on the Memphis soul-inspired “Shoe Boot.” As the Night Sweats got cooking, Rateliff shimmied onto the stage with a limber mashed-potato dance step. The crowd was clearly ready for the band, and Rateliff had little trouble bringing the audience into the action during the stomping “Be There.” “Chicago is honestly one of my favorite cities,” said Rateliff afterward, thanking local fans for years of support. “We’re so indebted to you.” The versatile singer uncorked a stinging Telecaster solo during the pleading “Look it Here.” The rest of the seasoned band shone as well. Mark Shusterman introduced the soulful stroll of “I’ve Been Failing” with slinky electric piano reminiscent of Tom Petty and the Heartbreakers keyboardist Benmont Tench, followed by a saxophone solo from the horn section that would have done The Big Man Clarence Clemons proud. Following the song, Rateliff drew an audible gasp from the room as he heaved his coveted guitar skyward from center stage to his tech in the wings. It was the first of several daring but successful toss-and-catch maneuvers. One hopes that the Night Sweats crew has a benefits package with a good dental plan. Rateliff put his whole body into singing songs like “Coolin’ Out” and the amorous “A Little Honey,” clenching, twisting and stretching into the shapes of his “baby please” lyrics, echoing the commitment of key influences like Sam Cooke and Stax Records giant Otis Redding. The band displayed its potency in unexpected ways when Pope’s bass conked out during a mid-set rave-up for an entire song. Despite the lack of the body-moving low end, the band kept the energy hot and groovy as Rateliff cast hopeful glances offstage between belting out his lyrics. His trademark tambourine-smashing moment may have had a little bit of extra gusto behind it due to the frustration with technical problems. Issues were resolved in time for a fervent sing-a-long during the single “You Worry Me” from the band’s 2018 album Tearing at the Seams. Trumpeter Scott Frock was featured on the lilting roots-rocker “Wasting Time,” and the full section took center stage to introduce “Babe I Know,” a soulful waltz-time crooner that recalled Ray Charles’ version of “Georgia on My Mind.” After a tight Booker T homage with “Intro,” Rateliff brought the crowd to fever pitch with “I Need Never Get Old” as he fell to his knees with hands stretched upward and trembling. The singer paused to speak about Chicago activist Jahmal Cole’s My Block, My Hood, My City charity supporting local underserved teens, promising to match every dollar donated up to $2500. “We’re happy to be here in your community to remind you how good things can be if we work together,” said Rateliff. Set closer “S.O.B.” punched a hole in the Aragon’s night-sky-painted ceiling, as every voice in the room was raised to full strength echoing Rateliff’s defeated but cheeky chorus and all bodies moved with the paradoxically celebratory rhythm created by Pope and drummer Patrick Meese. An encore of the meditative and Stonesy “Hey Mama” described hard lessons and a mother’s tough love. The McCartney bounce of “I’ll Be Damned” brought the urgent show to a brief but satisfying conclusion at 75 minutes. 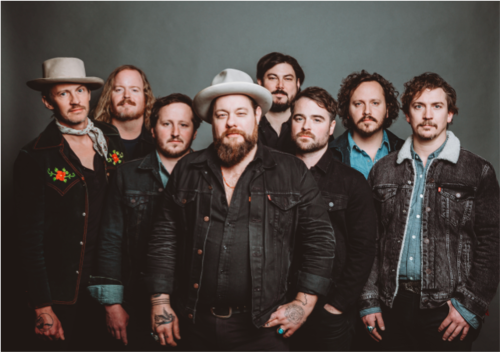 Once the hard-working Night Sweats take a long enough break from the road to produce a third album, expect the group to pack rooms this size under their own power and sustain headlining sets on the order of two hours. The audience will have its work cut out for them, trying to match the energy coming from the stage. Witnessing the elated mood of the crowd as it spilled onto Lawrence Avenue, Chicago should be ready for the challenge.